The SAP Process Journey provides employees full transparency on SAP’s operations and delivers a learning platform on all processes, end-to-end, in a single view. Digital transformation is forcing companies across all industries worldwide to change. And to survive, even the largest, most established corporations are challenged to adapt their business operations and models. Sounds familiar? Even within SAP, complexity and silo thinking remain one of the biggest impediments to achieving business and financial goals, and few companies are convinced that their simplification efforts are effective as they could be. What to do? The key to a successful transformation is the ability to understand processes, identify improvements and simplify operations. Mark Saul, Head of SAP Process Management, recently completed the Process Journey together with his team that helps identify and eliminate weaknesses in processes. “With the Process Journey we want to help our business to get full transparency on operations and provide employees a learning platform on our processes end-to-end in ONE view,” says Saul. The Process Journey provides SAP employees worldwide the opportunity to learn about the product path from Strategy, Portfolio over to Development, Marketing, Sales, Order-to-Cash, Post Sales until the Sunset of a Product. Furthermore, end users are now able to get an understanding on interfaces between different areas. The Process Journey provides a highly powerful overview on key processes in an intuitive manner. Key objective of this initiative to create a Process Journey was to build a process landscape which is easy to use for all employees and would combine the employee, company and product perspectives. The Process Management team identified inefficiencies within processes and cleaned up process duplications to ensure simplicity and accuracy. Most critical is that the Process Journey clearly reflects today’s operations. Focused on this purpose, clear and accurate process content is of highest priority. A key next step is the creation of the Customer Journey. Together with SAP’s Process Community, the Process Management team will continue the initiative to understand all touchpoints between SAP’s operations and the customer. 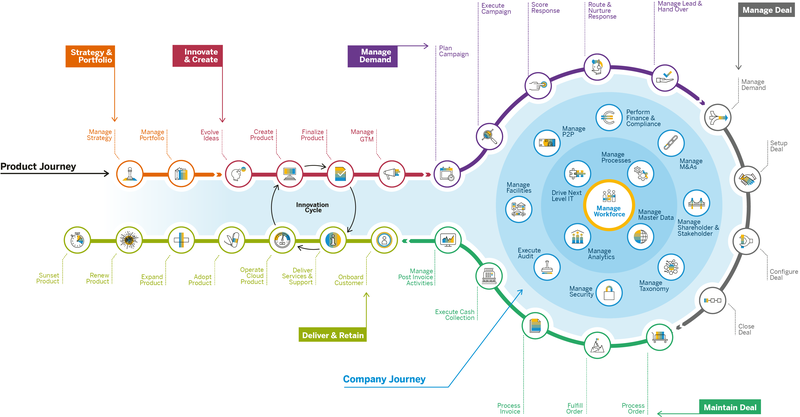 Connecting the Product Journey with the Customer Journey is one key pillar to make it easy for customers to collaborate and do business with SAP, as well as to simplify our own operations.